I had the Astro 220 and would put a e collar on too making him wear 3 collars(his home one with the tags of where he lives and phone number to contact me) but now i sold the Astro and sent the e collar back within the return period because I didn’t care for it all that much and I am going to get myself a Alpha 100. My setter is around 35-40 pounds. He was 37 when we were at the vet this summer but that was also when he had lymes but he’s better now but didn’t really lose weight with the lymes so I’d guess still around there. So I don’t know if I should get the TT15 Mini or tt15 normal sized collar. What would you guys recommend from your experience? Then in February I’m expecting a gsp pup if the breeding works and figure I’d need a tt15 not mini for him for when he’s 60-70lbs full grown. I talked to someone I know who has this system and he has a setter from the same litter as mine and he said he has a mini on her and it’s fine and said he’d probably do a mini on the gsp even full grown too. What’d you guys think for collar sizes for these dogs, assuming the gsp will be 65 ish pounds give or take. You think mini for both when I get the other add on collar in spring or just the mini for the setter? northwoodshunter wrote: You think mini for both when I get the other add on collar in spring or just the mini for the setter? I have two TT15s which I bought first when I bought my Alpha. Then I got a puppy so I bought a couple of Minis so I could track the puppy's movements while he was still small. Since then I have used only the Minis on 60lb GWPs. Never ran out of battery once using them close to daily for over 2 years now but I put them on a charger overnight during hunting seasons when they get longer hourly use. And I replaced my Alpha transmitter with a 550 Plus and like it much better. Unless you use the GPS mapping functions of the Alpha I think the far superior training ecollar functions of the 550 Plus make it the better combination dog GPS and ecollar tool. greg jacobs wrote: Standard gives you more battery life and distance. Tests have indicated that the difference in the mini and standard is insignificant. I have the mini and really like it on my 33 lb. Brittany. Battery life is fantastic and I've never had an issue with the distance. I’m gonna measure his neck before I order it too but I think the mini might be better for him. But snell at gundog supply says if you have a bigger dog that’s neck is bigger than 14” to get the bigger one that’s why I asked. Wondered how the mini works on the bigger dogs. I’ll be able to use the mini from my setter when the gsp is a pup until he’s big enough for the normal one(if that is what I get. I was looking at the pro 550 but I will only be running two dogs and my setter will only need one of the alphas stim buttons for training/hunting purposes and the gsp will have the other two as a tone and stim so I think this should work fine and I like to use the mapping to mark the truck and trail if I get to one to prevent the possibility of getting turned around. Have used minis on 60 lb dogs extensively for 2.5 years. Works fine. 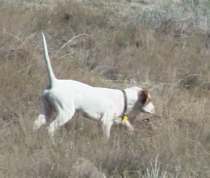 I need two stimulation levels per dog while hunting, one low for mild corrections around birds or retrieving and one high enough for trash breaking. With the Alpha the screen must be locked or otherwise you will bump the touchscreen and change settings without knowing it. Which is a disaster with a young and or sensitive dog if you give a correction at a much higher level than originally programmed (or conversely are unable to stop a behavior in action because the stimulation level is insufficient to do so). And changing stimulation levels on the fly with a locked screen is way too slow. Sharing my experience with both tools. The drawbacks to the Alpha get worse when handling 2 dogs is my and others I run with experience. averageguy wrote: I have two TT15s which I bought first when I bought my Alpha. Then I got a puppy so I bought a couple of Minis so I could track the puppy's movements while he was still small. Since then I have used only the Minis on 60lb GWPs. Never ran out of battery once using them close to daily for over 2 years now but I put them on a charger overnight during hunting seasons when they get longer hourly use. How many dogs does the gps on the 550+ track?? I just bought the Alpha with the bigger collars because it is still lighter than my T5 + ecollar. And I like to run two dogs together. If I remember from what I read on the garmin website it was either 2 or 3. Wasn't trying to influence his purchase. Was only giving him some facts. I'm sure the mini's are totally acceptable. Last edited by greg jacobs on Sat Oct 20, 2018 4:29 pm, edited 1 time in total. Steve, 3 dogs can be tracked on the 550 Plus. The toggle switch on the Transmitter moves the GPS signal to the dog selected. averageguy wrote: Steve, 3 dogs can be tracked on the 550 Plus. The toggle switch on the Transmitter moves the GPS signal to the dog selected. Get mini for sure I have 38lb brittany and the tt15 regular collar will not go small enough for her neck. I have one of each as I thought I would replace the Alpha with the new 550 plus but after try the 550 I like the Alpha way more. Thanks for the replies, that’s about the same size as my setter so I’m sure that’s a pretty close comparison, I ordered it today with the mini tt15 instead of regular going off of replies here and people I know with it. I think that’ll work just fine and I know the battery won’t be problem. Assuming range won’t be either as he is pretty much completely broke from chasing, rarely chases deer is at all and other animals like that, and I’ve called him off of points of porcupines, and another unknown animal and a few deer in North Dakota, even a few coyotes out there. 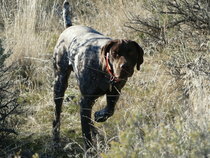 And he recalls well and am currently trying to adapt him to how he’d be handled in field trials and keep him broke. He’s slipped a little bit in steady ness but it’s getting back and his whoaing is a ton better then before.